A unique husband and wife team on the cutting edge of brain science, Dr. Dean and Dr. Ayesha Sherzai are authors of The Alzheimer’s Solution and are dedicated to educating people on the simple steps to long-term health and wellness through their work as Directors of the Alzheimer’s Prevention Program at Loma Linda University Medical Center, with patients, as well as through online writing, videos, and books. As Co-Directors of the Alzheimer’s Prevention Program at Loma Linda University Medical Center, the Sherzais, through research and their extensive collective medical backgrounds, work to demystify the steps to achieving long-term brain health and the prevention of devastating diseases such as Alzheimer’s and dementia. 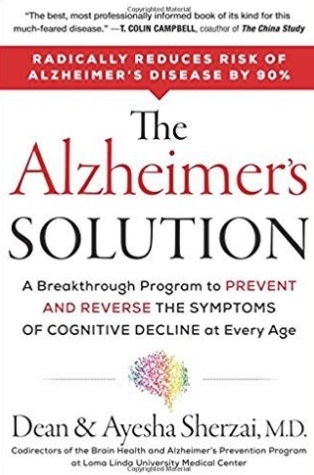 Dean Sherzai, MD, PhD and Ayesha Sherzai, MD, a unique husband and wife team on the cutting edge of brain science, are authors of The Alzheimer’s Solution. They are dedicated to educating people on the simple steps to long-term health and wellness through their work as Directors of the Alzheimer’s Prevention Program at Loma Linda University Medical Center, with patients, as well as through online writing, videos, and books. Because we are on the frontlines of Alzheimer’s research, we dedicate our time to first educating people so they can grasp the prevalence and seriousness of brain disease, and second, empower individuals and communities to have ownership in the future of their own health. By breaking the myth that diseases, particularly those of the brain, are predominantly hereditary, and giving people practical steps to decrease their chances of cognitive decline, we hope to bring down the instances of Alzheimer’s and other cognitive diseases..
What makes us the best version of ourselves? Because we are on a powerful mission to lessen the devastation that brain disease causes to individuals and families, we find that we are at our best when we are focused on delivering our research and findings in practical steps. We are our best selves when we are helping to change people’s lives. To introduce initiatives into communities that will demystify the steps to great, long term health and build strong healthy families. Our biggest success has been in our work within the communities. Being able to get outside of the clinic and transform the lives of those in underserved communities has transformed our own lives. Working in the clinic is very rewarding, but it is sick care. When we can get into the communities and get ahead of illness by teaching people to make practical changes, it’s incredibly rewarding. We feel like we can focus on disease preventions and bring significant risk reduction for parents, children and families. People need access to resources, information and healthcare. Being able to deliver these is what public health is really all about. Having family close members succumb to Alzheimer’s impacted us both to such a degree, individually, that it set the course for our life’s work. We believe that through education and community, we can decrease the prevalence of cognitive diseases and build healthy happier communities, together. One of them is Colin Campbell. He is the man behind the book, The China Study. He was foundational and profoundly courageous in putting out the data that has changed the world. This was the largest study in history on the influence of lifestyle and health and it was initially controversial but it carved a huge opening into the conversation and helped pave the way for us as well as others to work in our fields. We also greatly admire courageous doctors that go into the communities and invest in the people. They are taking risks with their livelihood when they get into the communities as those hours are not billable. The medical word can be a cynical place and these doctors see the value of getting ahead of disease by teaching about good nutrition. Dean Sherzai greatly admires his wife, who went to cooking school at night during her intensive vascular fellowship at Columbia University because she understood that in order to have great nutrition, people would need to understand how to prepare it. We enjoy places off the beatin’ path. The road less traveled is both a literal and figurative expression for what we enjoy. We like to visit places that are not very well known, but we also like to explore other thoughts and ideas. For example, as we explore other places and cultures, we are always looking for a way to introduce our healthy living tips into each lifestyle or culture we visit. You can have the rich distinction of native cuisine, and also eat a plant based diet, for example. These are fun challenges that we enjoy taking on. Our favorite tool is a recumbent bike in the living room. Sounds too simple? The truth is it’s the perfect way to combine something you want to do with something you should be doing. While winding down your day in front of the television to catch up on news or t.v., you can sit on a recumbent bike and pedal. It reduces vertical strain on the joints, you can pedal slowly for an hour or more and speed up to a quick pace during the commercials. It’s a great example of making practical changes for long term lifestyle shifts. We can’t stress the importance of organization enough in healthy living. For one thing, nothing helps stress management better than organization. We keep a whiteboard in our living room. It’s there when you think of things that need to happen, it’s great for free association and we can see and check off tasks with ease. A lot of people don’t realize this but checking off tasks turns on the dopamine. This gets you addicted to the behavior. Being able to make a to-do list and then check off what you have completed is great for stress management. Bicycling and hiking and cooking.